Neuchâtel trams: (steam) 1892 - 1902; (horse-drawn) 1894 - 1897; (electric) 1897 - today. Funicular (Ecluse - Plan): (hydraulic) 1890 - 1907; (electric) 1907 - today. Funicular (Chaumont): (electric) 1910 - today. Funicular (Fun'ambule): (electric; fully automated) 2001 - today. (All except the Fun'ambule): 1000 mm. Jacques, P.J. "The tramways of the Neuchatel area", The Modern Tramway, Nov. 1961 (24:287), p.324-327. Wansbeek, C.J. 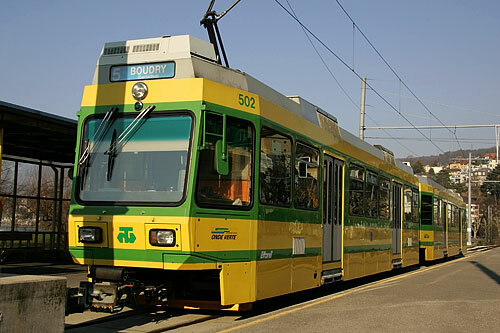 "Neuchâtel: Swiss lakeside city with tram-train ambitions", Tramways & Urban Transit, Dec. 2005 (68: 816), p.476-479.